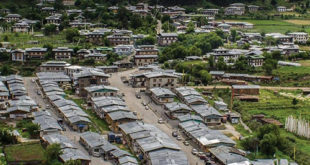 Given the fact that Bhutan is fairly an agrarian society and agriculture is the main source of income and livelihhod for the people in rural areas, agriculture received a major chunk of the investment in the 11th FYP and was also identified as the Five Jewels of the nation. The overall income of the farmers increased from Nu 17 bn in 2012 to Nu 26 bn in 2017 which signifies prosperity and will go a long in poverty alleviation. The report states that paddy harvest has increased from 75,000 MT in 2013 to 85,000 MT in 2017, maize from 76,000 MT to 90,000 MT, potatoes from 50,000 MT to 57,000 MT, and vegetables from 58,820 MT to 72,000 MT which comes at 113% of national requirement. Livestock produce also increased significantly with milk production increasing from 31,000 MT in 2013 to 50,000 MT in 2007 whereby 10,100 cattle were distributed in the current plan. Production of eggs also increased by more than double after the distribution of 1.1 million day-old chicks from 66 mn to 116 mn in the current plan, which led to egg self-sufficiency. The success stories of the agriculture sector have been attributed to some of the major public investments in the current plan which includes distribution of 1200 power tillers, 2800 km of electric fencing, 2600 km of irrigation channels among lot of other initiatives. To enhance livestock production, 10,100 cattle were distributed in the current Plan. In addition, the artificial insemination program was a big success as 34,000 inseminations were carried out producing 13,000 calves. The increase in the agricultural and livestock production is also attributed the land kidus granted by His Majesty. “Without His Majesty’s land kidu, we would have never seen this rising agricultural surplus caused by increasing agricultural production and productivity that is leading to improved social and economic welfare in our rural communities,” stated Lyonchhen. Lyonchhen said credit is an important means to improving the livelihoods of rural people by supporting investments to increase farm productivity. In the 11th Plan, the Bhutan Development Bank Ltd. disbursed more than Nu. 7 billion in loans to rural areas compared to Nu. 2.2 billion in the 10th Plan. In addition, Nu. 1.9 billion was budgeted for the Rural Enterprise Development Corporation (REDCL) in the 11th Plan and so far, 3800 projects have been approved with loans totaling Nu. 1.1 bn. 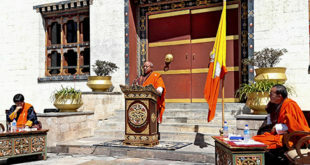 Lyonchhen said that to further improve access to finance for rural people, His Majesty the King has commanded the implementation of a priority sector lending scheme and as a result all banks now lend 1% of their total loans to agriculture and an additional 1% for rural based cottage and small industries. This Royal Command will be transformative for the rural economy and improve the lives of people. To boost and support the market economy in the country for distributing farm produce, the Royal Government in the 11th Plan established 187 farm shops. This is a new concept with the purpose of supporting local economies by providing a platform to buy and sell goods at reasonable prices. In the coming years, farm shops will become important distribution points to sell increasing agricultural and livestock production. As part of the Royal Government’s efforts to “bank the unbanked”, 200 gewog banks were opened in the 11th Plan and already 13,571 bank accounts have been opened by rural based clients depositing Nu. 178 million as savings. In total, Nu. 307 million worth of transactions were recorded. The PM said that this is another indicator of growing prosperity of rural communities and inculcating a habit of saving that result’s in capital formation and associated multiplier effects in the economy. Lyonchhen said that for the first time Bhutan is seeing poverty in the single digits at 8.2% in 2017 compared to 12% in 2012. He said this decrease in poverty is a result of the numerous initiatives that the Royal Government has undertaken including those that were mentioned earlier. During the 11th Plan, special targeted projects to reduce poverty were implemented in 75 villages in 18 Dzongkhags. These projects included the construction of 837 houses, 777 toilets and 14 water supply schemes, formation of 94 self-help groups and distribution of 260 agricultural and post-harvest machines. Lyonchhen said that a major cause of poverty is disasters as it destroys livelihoods and leads to extreme hardships. In the 11th Plan, His Majesty has personally provided relief to victims of natural disasters. Even though there were no major disasters in the 11th Plan, His Majesty granted relief of Nu 975 million as compensation and Kidu to the people and to repair damaged infrastructure. Further, to ease the impact of disasters on farmers and also to help prevent people from sliding back into poverty, an endowment fund for crop and livestock has been established to provide compensation to farmers in times of disasters. In parallel, the rural life insurance scheme was also increased from Nu. 15,000 to Nu. 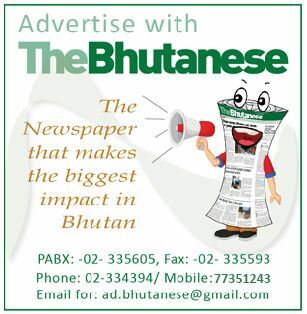 30,000.
can you provide the information on the average individual income of bhutanese farmers?